"Just wanted to express how much Kassidy enjoyed being involved in the last two productions. It was a great experience and she is excited for upcoming programs. We hope that the group continues in Ardsley. The kids loved it and it was a great experience. Thanks for all your hard work and dedication to the group." "We were looking for a first theater experience for our 7 year old daughter. At the perfect time, a flyer came home from school in our daughter's backpack. We took the plunge, and our daughter bounced in happily to each rehearsal and came out joyfully singing the songs from The Sound of Music. 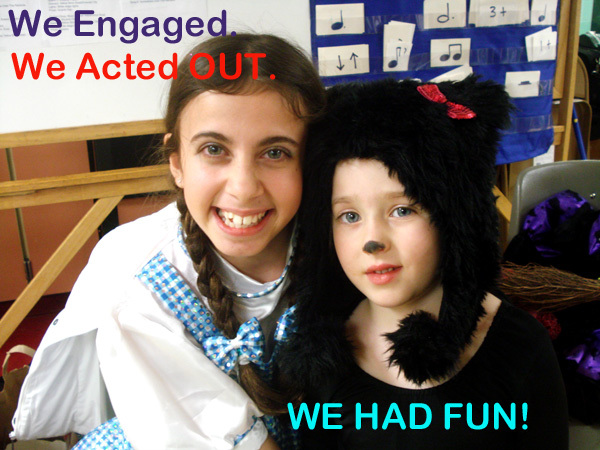 Her experience from beginning to end was extremely positive and she can't wait to be involved in another play. Many thanks to Robby and Diana for their hard work. Bravo Drama Discovery!" "I was very pleased with the program. Jessica loved it and I was very happy with the production. I think you did a fabulous job!! She is looking forward to the week long sessions this summer, Tom Sawyer and The Little Mermaid as she just can't get enough!" "Very kid friendly and sweet. Low stress introduction to drama." "My son Brett participated in her production of Peter Pan and had a wonderful experience . . . it was his, and our, first experience in theatre production. My son was six at the time . . . He was able to have a meaningful role as as learn bout the teamwork required in a large production . . . the children responded very well to Robin and learned a great deal. Finally, the production of Peter Pan was both intricate and beautiful where all the children had a chance to be in the spotlight. "Drama Discovery has given my daughter Casey so much confidence through the dramatic learning process; confidence which she carries with her still. The group went through a bonding which has also continued, as Casey still sees and talks about some of the children! I love the fact that [the company] gives kids a chance to shine . . . at all levels of abilities!" "BRAVO to Drama Discovery! My son learned to work as a team member. Being part of this wonderful theatrical group has built up both his self-confidence and self-esteem so much so that it is having a huge positive impact on his academics. He now has the self-confidence to get up on front of his class, make speeches, give oral reports with ease and even run for Student Council! I highly recommend Drama Discovery for its wonderful learning experience, the performances are Brilliant and simply because the children Love it." "I have never seen my child's eyes sparkle as much as they did this Summer when she was in the play!"